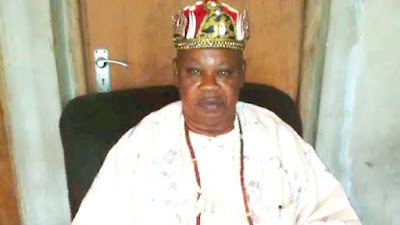 Tension yesterday enveloped Ogbozinne Autonomous Community, Nkanu West Local Government Area of Enugu State over the killing of its traditional ruler, Igwe Stephen Nwatu, by some of his subjects. Nwatu died at the Enugu State University Teaching Hospital (ESUTH) where he was rushed following the beatings he received from some members of the community who were said to have pounced on him angrily on Monday afternoon. About 15 houses were reportedly burnt by members of the community loyal to the monarch in reaction to his death even as the police battled to restore sanity. The community is said to be in crisis for sometime now over the election of leaders in the town’s union.It was gathered that the slain ruler had always opposed the election of town union leadership, leading to divisions in the community. The faction opposed to the stance of the monarch was said to have protested before now to the Enugu State government and had taken the case to court when resolutions on the matter could not be reached. The trouble that however claimed the monarch’s death started on Monday when he allegedly led some policemen to cause the arrest of a member of the faction opposed to his stance in the community. Members of the group were said to have descended on him as the policemen took to their heels and gave him the beating of his life.Another version of the story said the monarch was beaten as he tried to stop members of the community from attending a meeting of the two groups at the government house on Monday over the crisis. He was said to have while trying to stop some persons from attending the meeting caused severe injuries on five natives who are now recuperating in the hospital. Angered by the development, the people pounced on him and gave him the beating of his life leading to his being rushed to ESUTH where he died at about 1:00a.m. yesterday.Chairman of Akanu West local government area, Henry Ikenna, confirmed the development. He said he was informed about it on Monday afternoon and rushed to the hospital to discover that the traditional ruler had been revived.“He spoke to me after he was revived. Regrettably, around 1:00a.m., I received another call that he has passed on. I equally rushed back to the hospital where I found it to be true. We made efforts to deposit him to the mortuary. “Since Monday night, the police have been battling to ensure peace in the community. The burning of houses might have started after the police left the community. I have briefed the governor on the development,” he said.The Police Public Relations Officer (PPRO) in the state, Ebere Amaraizu, who also confirmed the incident, decried the attitude of the irate community members over the alleged death of the monarch. “No circumstances should warrant anybody taking laws into his hands to the point of killing another. The law enforcement officers are there and should be made to handle any issue. We have commenced investigation into the matter and we will bring to book all those responsible for the death of the monarch,” he said, adding that efforts were on to restore peace in the community.